This Application is a Windows Desktop Application which allows you to download one or more files from a SharePoint Server to your local machine. This Application will need to run on the Server which runs the SharePoint Website, and you need to be logged into the Server as a User that has Administrative Access to the SharePoint site. 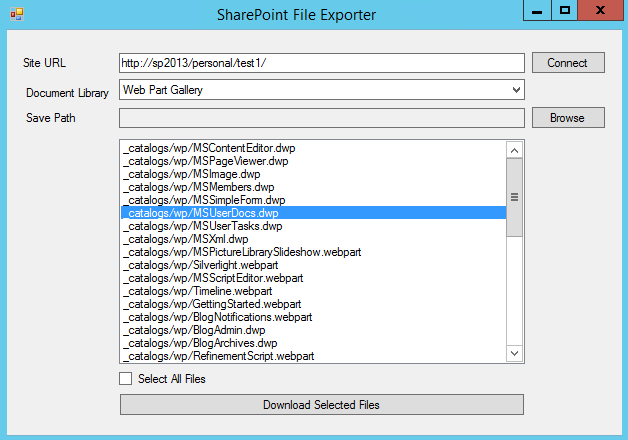 - SharePoint 2013 or higher installed. - Microsoft .NET Framework 4.5 needs to be installed. - You must be logged in as a user that has Administrative Rights to the SharePoint Website.